From a very young age, my father always told me “Just because they’re grown, it don’t make ’em right. Just because they’re big, it don’t make ’em bright.” At the time, my dad’s primary subjects for this quote were faculty and staff at my elementary school. My parents were not teaching me to disregard or disrespect authority, but they wanted me to understand that adults do not have everything right all the time. Grown ups make mistakes too, and I should not be afraid to challenge them if I see them behaving unfairly or inappropriately. My super suburban community outside of Seattle, Washington was (and still is) very homogeneous. Overwhelmingly white and upper-middle class. While these demographics made for a very strong academic environment (let’s face it – higher tax base equals higher quality education), I certainly suffered socially. In a culture of sameness and conformity I stood out, whether I wanted to or not. Since the disturbing news broke last year that famed comedian Bill Cosby had allegedly drugged and sexually assaulted several women over the course of his career, I have remained silent. 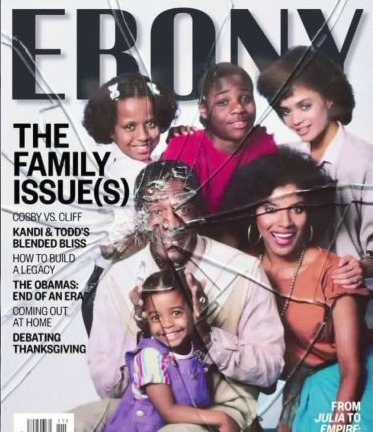 However, once Ebony Magazine released a heartbreaking image of the Huxtable Family with shattered glass splintering from the Cliff’s face, I felt it was time to add my two cents to the conversation, whatever that may be worth. Due to my father’s advice about adults being imperfect, I cannot say that I was shocked or in any sort of denial but I was, and still am, sorely disappointed. The idea that an iconic institution like “The Cosby Show,” so deeply ingrained in my identity as a black girl growing up in middle class America, is now contaminated in such a tragic way is very upsetting. Certainly when people we admire make poor and damaging choices, we become filled with a wide range of emotions. Personally, I am hurt by Mr. Cosby’s alleged despicable behavior. As someone who has witnessed first-hand the devastating effects of sexual abuse in the lives of close friends and loved ones, I am distraught. Could it be that a clean comic with timeless humor and a manipulative predator with desperate ways are one in the same? Can I separate the two? Will I ever be able to enjoy the comfort-food sitcom of my youth again? Should I enjoy it? Despite my personal feelings of abandonment and deceit, the impact on society and black culture in particular is clear. The standby example of a positive portrayal of a segment of the black population in America will forever be marred by an asterisk connected to a footnote, explaining that this type of family simply does not exist. The list of comedians able to make people laugh without being vulgar or insulting has just become shorter. Future generations of all races will no longer be exposed to a lesser-seen side of African-American culture. Quality family viewing, free of profanity, innuendo, and double entendre will be forever hidden in the depths of the archives, the tainted memory too painful for many to bear. I commend the alleged victims for coming forward with their stories, for standing up to an American treasure. Opening up about being raped or sexually abused in any way – by anyone – takes tremendous courage. I cannot imagine sharing with the world such a personal story about such a larger-than-life man. My heart aches for these women. So why am I still so torn? Why do I desperately want, or need to reserve a place for “The Cosby Show” in my heart? The desire to continue to appreciate a television show that is now marred by such controversy is one that causes me to question my goodness and empathy. I worry that my wish for the show to return to air is selfish and unfeeling. My hope is that these concerns are not true manifestations of my character. I hope that I still work toward goodness and practice empathy. Thankfully, I am not alone in this challenge. There are parents and principals, construction workers and counselors, doctors and ditch-diggers who are all trying to be good people, doing good things for other people. The overwhelming majority of black, American boys are not on their way to prison or in the street hustling. The overwhelming majority of black men do not seek to do women harm. In fact, I chance it to say that all black boys and men love their families and want to succeed in providing for them and to be a part of their lives. All black boys and men want to make lasting impacts and positive influences on their communities. All black men want to change the world for good. It is my greatest hope for the black American community and the world as a whole, that all black leaders continue to rise to the occasion. May we exceed all expectations in life and leave a lasting legacy in death. May no fault of any one man tarnish or stain the positive differences we can and do make in this world. It is up to the global community to do everything we can to be examples and create opportunities for black children to realize their greatest potential in life. As a child I had a complicated relationship with snakes. I lived indoors, snakes lived outdoors. I loved being outdoors, but I did not love snakes. As is life, one cannot survive indoors alone. As I often frolicked in the fields of green dewy grasses in the super suburbs of Seattle, I occasionally encountered a snake or two. They were usually harmless and nonvenomous; despite this fact, their very presence struck a fear deep within me and caused me to run as fast as my child-sized little legs could carry me. Over time, each unexpected encounter with these snakes rendered me home-bound for a day or so, for fear of running into them again. I do not know if it was the fear of having the life constricted out of me by a boa or if I simply did not like the way they look, but the phobia of snakes had an unfortunate mental hold over me and stole many opportunities for me to bask in the sun that beams on the dewy fields of the super suburbs of Seattle. 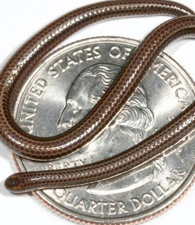 Imagine my delight when I found out that Barbados has only one species of snake – the Threadsnake , its size diminutive enough to coil upon a quarter. I am free to once again stroll our yard shoeless, unafraid of what serpent may be lurking under a bush or behind a tree. I never knew how much I missed such a simple liberty until relocating to this tropical island just two short months ago. Just one month and one day before my family and I left for Barbados, a white man entered the historic black church, Emmanuel African Methodist Episcopal Church in Charleston, South Carolina. Parishioners were engaged in weekly Wednesday night bible study and welcomed the presence of this stranger in the sanctuary. Despite the outpouring of Christian love given this individual, he opened fire, killing nine people, injuring one. Forever changing countless lives. This mass murder was just the latest occurrence of race-related violence against African Americans. Though the initial narrative began centuries ago, the story remains the same as black lives in America hang in the balance as the result of both cultural and systemic racism. More recent displays of racially motivated aggression pit some members of law enforcement or rogue racists against black males as police brutality is highlighted daily on the evening news. College graduates pulled over for minor traffic violations and pastors attempting to deliver messages of peace and forgiveness have all fallen victim to the ills of the American racial climate. In particular, black boys and men are targeted every day as a result of the centuries old prejudices and preconceived ideas of the implications of blackness. Inasmuch as America views blacks as talented and entertaining, messages from relatives and the media alike teach many non-blacks that dark skin and coarse hair envelope a character that is to be both feared and guarded against. These brown hued beings are not to be trusted in your communities or your workplaces, with your women or your children. It is your duty, white male, to shield this fair land of yours. By any means necessary. The end result of such widespread, if at times subtle, paranoia is that black women and children pray daily for the safe return of their black husbands and fathers for a hard day’s work. The coming-of-age of young black boys is not marked by celebration but by fear, as daddies equip their sons with all the skills they need to avoid arrest and/or death in the likely event that they are pulled over for speeding (as many teenage boys are) or an illegal lane change (as many new drivers are). Parents hold their breath for four years as their children venture off to pursue higher education in a small college town in the deep south, wondering when they will receive a call late one night that their baby was beaten to death because they were walking home alone at night while black. Black families across America arise on Sunday mornings and prepare to worship a loving God who promises to care for and protect them, praying throughout the service that they will not meet their Maker on this day. When I was about 10 years old, my mother and I were walking home from an afternoon of biking riding. As I coasted down a slight incline, the wind in my face and the sun on my back, my mother just a few yards behind me on foot, my perfect afternoon turned into a dark day I will not soon forget. A red pickup truck baring the Confederate battle flag sped past us in our middle/upper-middle class neighborhood in the super suburbs of Seattle. Two white men sat leisurely in the bed of the truck, an unknown number of passengers in the cab. Stunned, I dismounted my bicycle and began to walk along side it, my hands shaking on the handle bars. My mother gently, yet urgently told me to stop. I dropped the bike and ran desperately into my mother’s warm embrace. As hot tears flowed thickly from my innocent eyes, I could only think to repeatedly ask my mother why? This word was not foreign to me. Classmates had even called me the N-word in kindergarten. But this time was different. This was more real, more raw. Perhaps it is because my father was not at home at the time so we felt more vulnerable. Maybe it was because this particular imagery was only supposed to exist in the black and white footage of the PBS documentaries featured during the month of February. Whatever the reason, I was pained to my core and still have flashbacks to that incident, over twenty years later. The verbal assault I encountered on that blustery spring day, in the super suburbs of Seattle, was not my first experience with racism, nor would it be my last. Whether a direct victim of racial injustice or a witness to its devastating effects on my family and my cultural community, race and racism has always played an integral part in my existence. Denial or avoidance are a futile non-options. Pickup trucks yielding the Confederate flag still render in me a reaction of fear and a feeling of vulnerability. When I am either followed or ignored by store clerks at a local retailer, my heart is heavy under the unwarranted spotlight of suspicion or irrelevance. When my father returns home for literally the 40th time to report that the had been pulled over by a police officer — without receiving a ticket — I exhale in a deep sigh of relief, knowing that my daddy survived a potentially deadly ordeal. So imagine my delight when we arrive in the Caribbean to discover that its black citizens walk the streets with an admirable freedom from care. Children walk to the bus stop at dawn, couples walk along the beach at sunset, and young men walk to the homes of their friends on Friday nights. All are unafraid that the melanin in their skin might cause them not to return to their homes and loved ones. I now have the mental liberty to walk to the local coffeehouse with less fear of who lurks inside utility vehicles or beneath white, hooded robes. The absence of large, venomous snakes caused me to realize the freedom I was missing in the United States, where snakes are far more prevalent and potentially harmful. I know enjoy enjoy the fairly snake-free life I now leading in Barbados. Having resided in Barbados for only a short while, but the absence of the ever-present fear of danger following me and my loved ones is also enlightening. Only now when I watch local coverage of United States news, do I fully realize that the state of race relations in America is truly unfathomable. There is nothing normal about living in a constant state of fear and uncertainty as the result of a handful of people’s tragic ideas about your God-given features. Does racism exist in Barbados? Certainly. Does this racism have a daily effect on the lives of black people in Barbados? Undoubtedly. Does one’s race in and of itself serve as a catalyst for unsolicited violent encounters? No, it does not. I do not know how long I will remain in the Caribbean, but it is my hope that if I do not to a freer, safer United States, that I would at least be able to positively contribute to the continual discussion on race in America. I want my presence in a country whose freedoms I certainly enjoy and value to be an impactful one. I wish to use my own personal, diverse relationships as an example of racial harmony and progress. I want to reach out to those who are victims of the cycle of racial inequality and encourage them never to give up. I want to appeal to whites and other allies in law enforcement, legislation, and education, to be vocal about the injustices all marginalized persons experience. I want to take the rebellious spirit of pride and renewal of the Barbadian people along for the cultural Revolution.